In 1968, also known to baseball fans as “Year Of The Pitcher”, Carl Yastrzemski of the Boston Redsox, won the batting title with a .301 average. He was the only player that year to have a batting average over .300. To this day, it’s still the lowest batting average to ever win a batting title in Major League Baseball. 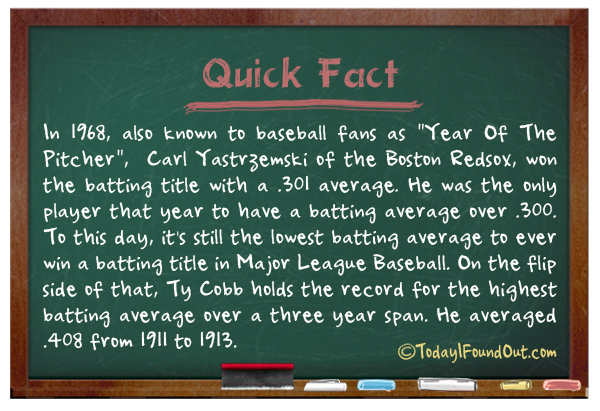 On the flip side of that, Ty Cobb holds the record for the highest batting average over a three year span. He averaged .408 from 1911 to 1913. MIstake! MISTAKE! Carl Yastremski was not the only player to hit over 300 in 1968. He was the only Al player to hit over 300. Several NL players did it including Pete Rose who lead the NL with a 335 avg. Too, it leaves out those players who may have hit 300 but lacked the minimum number of ABs to qualify for the title.